Steven Universe and Star Butterfly enjoy some some Cookie Cat. oh my god! two of my favourite shows in one piece of cute and beautifull art! great job! How didnt I make this connection? Brilliant. They would TOTALLY get along! Aaahh i love this so much!!! This is amazing. XD I Just... I can't do it. I need bleach for my eyes. Hello, I was wondering if you could please give me feedback on a video I made called gembound gameplay if you wanna check it out. Is it bad that I ship them? Their both 14... Well Steven is, I think Star is 15 or 16. Not a big age gap then. Steven Universe and Star Butterfly enjoy some some Swedish GB Glace Sandwich ice cream. If only someone were to add Mabel Pines to the mix. (panicked) NO!!! DON'T DO IT!!!!!!!!!!!!! And dammit, I was a bratty tomboy as a young girl! I'd get my hands on any ice cream sandwich! 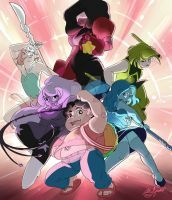 Cartoon Network: So glad to have you on the team. Daron: So glad to be here. Cartoon Network: Wait what? we don't have promos for our other show Steven Universe? Daron: I think I can help. Cartoon Network: How can you? Daron: Let's just say I know a guy. Star: you eat these??? it's soo good!!!!! !